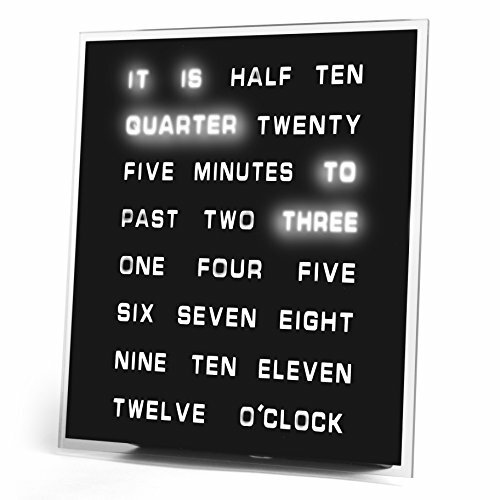 The time is displayed as text in five minute intervals. Wall mount or desktop with built-in stand. Dimensions: 8″ x 8″ – Includes AC adapter. 12" x 12", 12" x 12" Elite, 8" x 8", Spanish 8" x 8"
CREATE THE PERFECT SETTING: Use this fantastic light up furniture to create your perfect party, BBQ, or any social gathering ambiance. Use the button or the remote to set the multi colored LED lights to one of dozens of lighting settings. Remote also has 4 dynamic color change modes, flash, strobe, smooth and face. See description below for full range of furniture. WATERPROOF & CORDLESS: Useable both indoors and outdoors, this item is fully weatherproof. This durable light up furniture is great for pools, gardens, porches etc. Easy charging allows for convenient portable use. A full charge gives you up to 12 hours of use! No set up - made with toy-grade material - child safe. SENSORY MOOD CENTERPIECE: Use as a centerpiece for events and is guaranteed to get your friends, family, guests, co-workers, or patients talking. Great toy for sensory seekers with the light changing settings, and the ability to touch, feel and hold the furniture.